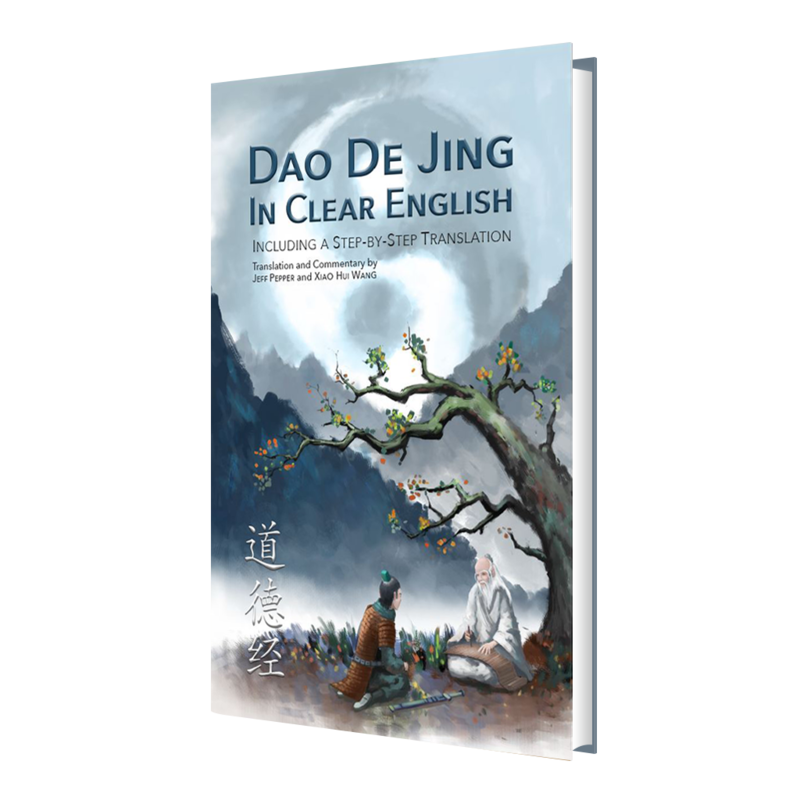 The Dao De Jing (also called the Tao Te Ching) was written more than 2,500 years ago and is considered one of the most important books in world literature. Coming in at only 5,000 Chinese characters, its timeless wisdom has inspired millions of people around the world and serves as one of the cornerstones of the Taoist religion. It has been translated into English many, many times, but this new work by the best-selling writing team of Jeff Pepper and Xiao Hui Wang is much than a translation. The authors have taken the unusual step of not just giving you the English translation, but also showing, word by word, how one gets from the original Chinese characters to the English version. Each of the 81 short chapters contains a beautiful English translation, followed by a word-by-word and line-by-line breakdown of the chapter, showing the original Chinese, the pinyin (phonetic spelling in English characters), a word-for-word literal translation into English, and occasional helpful notes to help the reader better understand the translation. The result is a book that can be read casually, or studied carefully, or anything in between. It’s impossible to do a 100% literal translation of the DDJ. Ordinary modern Chinese is quite different from Western languages, and the language used in this book is even more different. To start with, the original DDJ is extremely compact. Its verses have very few connecting words, forcing the reader to think deeply about the verse in order to tease out its underlying meaning or meanings. Some words can, depending on context, serve as nouns, verbs, adjectives or adverbs. Verbs in Chinese generally have no past, present or future tense, nouns have no gender (male/female), and no number (singular/plural). And to make things even more difficult, helpful little words like prepositions and pronouns are often missing entirely. As a result, translating literally from Chinese to English usually results in gibberish. Pepper and Wang have added just enough connecting words so that the sentence makes sense, while still expressing Laozi’s thoughts as concisely as possible. They’ve also tried really hard to avoid the temptation to add things that weren’t already there in order to make the sentence more readable. A Pocket Edition of this book is also available. The Pocket Edition contains only the English translation, not the original Chinese or the detailed translation notes. It’s only 114 pages vs. 380 pages, and it’s a smaller size (5″x8″ instead of 6″x9″), making it a better fit for the pants pocket.